Discover how Damian first met Leigh in the story “Good Evening, Princess”. 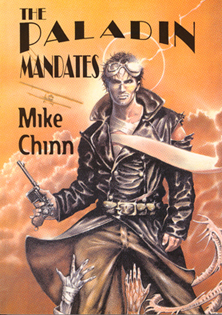 This and another five Paladin stories – featuring monsters, heroics and biplanes – are all available in The Paladin Mandates by Mike Chinn. Mixing in generous dollops of The Scorpion, The Shadow and Dominic Fortune, with a fascination for old airplanes, a taste for 1930s detective fiction, and the simple desire to tell a creepy tale, resulted in the first Paladin story: “The Death-Wish Mandate” (revised in this collection as “I’ve Got You Under My Skin”). Pulp heroics at its best! 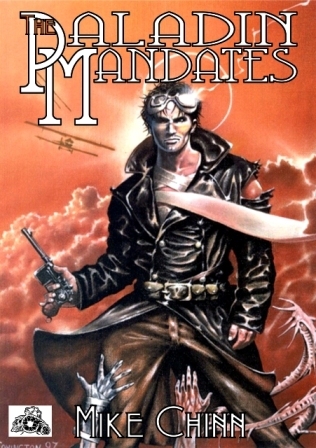 The Paladin Mandates is now out of print from The Alchemy Press. But a revised edition – including a brand new tale, “There’ll be a Hot Time in the Old Town Tonight” – is now available for the Kindle edition from Amazon.co.uk and Amazon.com.